Owners of pubs, bars, hotels and restaurants can capitalise on the outdoor screening of football matches and other sporting events with the Aqualite range of IP66 rated waterproof, weatherproof and football fan proof range of outdoor TV screens. Brighter times are on the way for pubs, bars and hotels with beer gardens and an outdoor screen can provide an additional attraction to customers and turns unproductive outdoor spaces into revenue generators. The scale of the business opportunity for regional and local breweries, pub chains and pub companies to boost profits shouldn’t be underestimated. The Aqualite range of outdoor display screens can withstand the extremes that a European summer can produce be it bad weather or good weather and also gives viewers the very best viewing experience. These great sporting events are a real boon for publicans and bar owners especially if they have outdoor smoking areas, beer gardens or terraces. 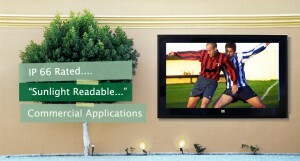 Aqualite Outdoor TVs are designed for commercial and residential applications in gardens, courtyards, patios and sun terraces. Often used for outdoor advertising and signage display systems in garden centres, flower shows, outdoor events, nurseries, pub gardens, beer gardens, outdoor smoking areas, etc. Owners of pubs, bars, hotels and restaurants can provide outdoor screenings of big sports tournaments in pub beer gardens, courtyards, car parks and, in fact, any outside area with an Aqualite IP66 rated weatherproof Outdoor TV screen. Digital signage display systems can be used to broadcast sports games and other big events in pubs and bars. The Aqualite range of all weather, outdoor screens can also be installed in pub gardens, terraces, designated smoking areas and any other outdoor area. Besides just showing a simple price list, digital display signage can also present rich, lively promotions to boost food and drink sales or to promote upcoming events and sporting fixtures.